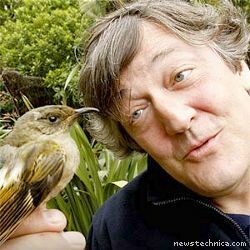 DAILY SMSGRAPH, King’s Lynn, Saturday (NTN) — The international press has urged Twitter users to “keep calm and carry on” during Stephen Fry’s break from the service to write his autobiography. The 52-year-old author, television presenter, wit, bon vivant, cheese board, Swiss army knife, well-stocked cellar and ineffable genius’s break was occasioned by the promise of “rather large dumptruck of £££ sweeties, toodle pip!” should he manage to finish writing his “book” — an experimental literary form involving a paper printout of several thousands of tweets’ worth of text, intended to be read more than a single time — without exercising his F5-pressing finger. He has also taken time out from television, writing and public appearances, but Twitter was, obviously, the matter of pressing international concern. President Barack Obama sought to calm the agitated masses in his State of the Twit speech — “We’ll teach Oprah to love again” — and Winston Churchill rose from the grave to bolster Britain’s resolve with stirring oratory: “Your Courage, Your Cheerfulness, Your Resolution Will Bring Us Fry! Also, braaains.” Peter Mandelson smiled a little smile that the Internet appeared to be falling apart according to plan. US actor and comedian Ashton Kutcher, who has 4 million followers, also threatened to quit the site in reaction to talk of a Twitter-fueled reality television show, as opposed to a reality-fueled Twitter show.